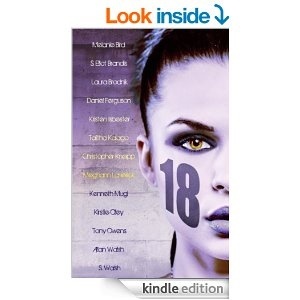 18 is the new Anthology released today as an E book on Amazon. Celebrating the great writers group in Brisbane, Vision Writers’ 18th year since it began. With many published members, including founders Marian De Pierres and Rowena Corey Daniels, the group is a fantastic cauldron to throw down your current work in progress and hear honest and invaluable advice. My writing would not be anything were it not from the lessons I have learned from this fabulous mix of Sci fi, Fantasy and Horror Authors. And so I’m excited to announce that our anthology 18 is available. Showing off the talents of some of the current crop of authors, thirteen stories of other worlds, other places, other times. From Tales of Dragon’s to Gangsters and wizards, the stories will take you to places of wonder and horror. My own story is the last, appropriately closing out this excellent collection. Thanks to all who had a hand in making it happen, Trahern, Belinda, Talitha, Meghann, and all the other writers involved. So go get it, read it, tell me what you think.